Blog How to Soundproof Car Doors? 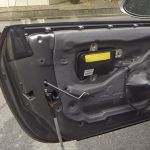 Sound Deadening Car Doors That Works! A quieter ride, fewer distractions, and an overall more comfortable environment are what you can expect when you start soundproofing your car. The methode of soundproofing we will be talking about is not only to make your door feel less hollow but it will also stop the vibrations if you turn on some heavy base. Some people also call it by what it really is which is sound deadening your car door. After you’ve completed the process you will notice the car doors sound a lot better when opening, closing the doors and especially while driving. If your car doors do not have any sound deadening applications the door will sound hollow and thin, essentially making the car sound cheap. 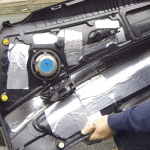 You can achieve better sound deadening for your car door for approximately $20! I will give you a bit of a backstory on the car that I own. And good reasons for sound deadening a car door. This story can apply to many cars on the road today. I own a small BMW sports car that sounds cheap when opening and closing the car doors. I didn’t really notice that much when I fell in love with it in the used car lot, or maybe I just chose to overlook that small aspect of the vehicle. BMW wanted to build a sports car that was lighter than the previous generations and also its competitors. In order to make the car lighter, they decided that sound deadening the car doors was not worth doing. Because of the lack of soundproofing in the car doors, they sound like they are going to fall off every time you open or close them. 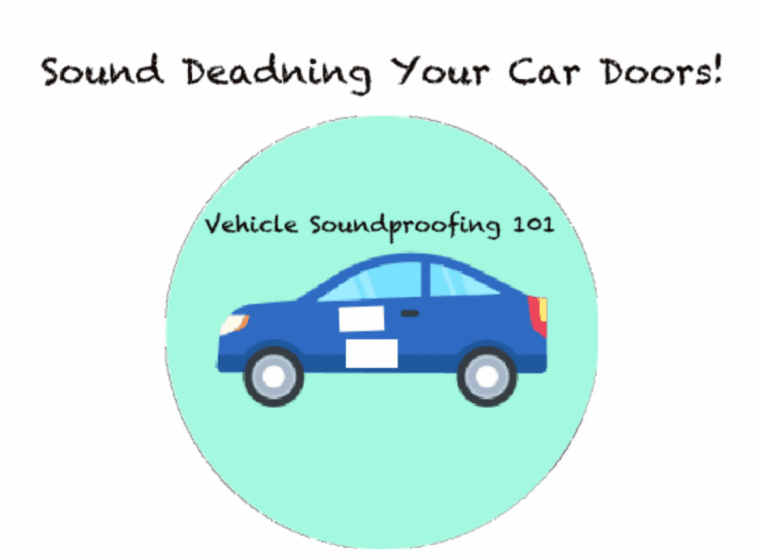 You can easily check if there is soundproofing in your car doors by knocking on them. If they sound hollow they probably lack the proper sound deadening elements. If they sound heavy and thick, they most likely have something in there that is helping with the sound deadening. BMW Corp. also decided that it was a bad idea not to have sound deadening in their car doors. In later years, they added the proper material inside the doors to make them sound much better. The sound deadening material inside the car doors also makes the vehicle feel more upscale. 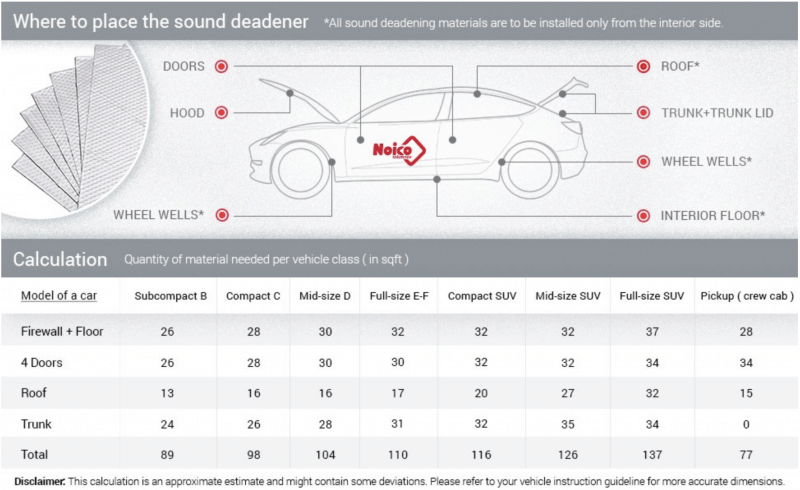 Noico 80 mil Sound deadening mat is what I used to sound deaden my car doors. At the time of purchase, it was the best price for 80 mils automotive butyl and foil sound deadening on Amazon. It was also around 20% less expensive than Gtmat, Boom Mat, and Extreme. It turns out to be a more cost-effective solution than such brands as Dynamat Xtreme, Hushmat, and Stinger RoadKill as well! 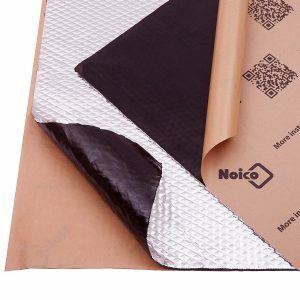 Noico 80 mil Sound deadening mat. I see some people using the same adhesive tape that is being used to repair the roof of their house. It is less expensive than this product that is made specifically for sound car doors sound deadening. The problem with some of the roofing adhesive tape is if you live in a warm climate the tape will begin to smell like asphalt. 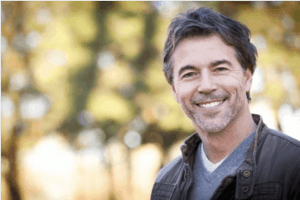 Buy the right product so you don’t regret it months down the road. This particular automotive self-adhesive insulation consists of butyl. Noico sound deadening has a total weight of 0.7 lbs/1sqft. This weight ensures maximum efficiency and sound insulation; Knowing how heavy it is, you won’t be sacrificing any horsepower like some automaker seems to think by not sound deadening car doors, I think it is just a cost-cutting initiative on the part of the car companies. You can maybe find this product or something like it at your local hardware store. You can also click here for pricing information on Amazon. Depending on what car you have, you will have to find the necessary screws to take out so you can remove your inner panel. You can find that information in your vehicles owners manual. If the information you’re looking for is missing from the car’s owners manual you can easily find what you are looking for on Google. After you’ve successfully removed the inner door panel you should see a seal that you need to remove. You might need a razor blade to be able to take the seal off the door panel. The seal should be fine If you’re careful and you take your time removing it with the razor blade. 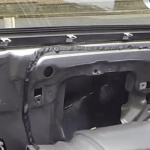 Keep removing the seal until you see a hole and have sufficient access to your inner door panel to place the sound deadening tape in your car door. Carefully place the sound deadening tape into your car door through the exposing holes. Make sure to cover the entire surface as best you can. After you’re done, knock on the exterior of the door to see if there are some hollow sounding spots left and cover those surfaces. Since you have the inner door panel plastic part removed, tap on the plastic and cover the hollow sounding spots with the car door sound deadening tape. You will see in the before and after pictures if you’re unsure as to what I mean. Behind the plastic panel taken off. Note: Do not unplug the doors airbag because you probably will have an airbag light come on. Now that you’ve finished taping the interior of your car door with sound deadening tape you can now put your door back together. An alternative car sound deadening material you can apply to the interior of your inner door panels comes in the form of a spray. In the past, it used to be that spray-on sound deadener in-car applications were only done in professional shops. Now anyone can purchase this product in an arosol can and do it the DIY way and save tons of money. Boom Mat Thermal Acoustic Control. Here is the full product description. “Boom Mat Spray-On sound deadening is perfect for reducing unwanted road noise; deadening vibrations in those hard to reach places. Places such as trunk interiors, fender wells, undercarriage, body panels, rear quarters, and inside door panels to name a few. Boom Mat Spray-On also serves as a thermal barrier insulating against unwanted heat. Whether you are looking for a quiet ride by eliminating squeaks, rattles, vibrations or unwanted engine and road noise, the benefits of Boom Mat Spray-On sound deadening can be used on any vehicle. 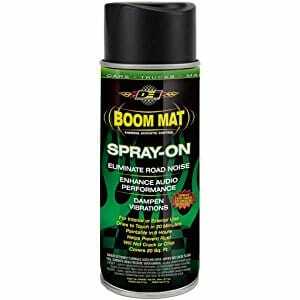 Boom Mat Spray-On can be applied in multiple layers for even more sound deadening while handling temperatures up to 300 degrees Fahrenheit. It can be applied to non-coated surfaces and can be top coated with paint after only 6 hours of dry time. Boom Mat Spray-On is VOC (Volatile Organic Compounds) compliant in all 50 states.” Description from Amazon.com. The application of a spraying sound deadening product would be substantially the same as the above application method. 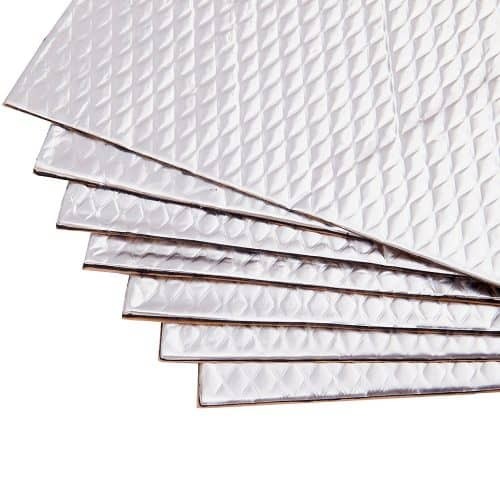 Here is more information and questions you might have that we are able to answer about the Noico 80 mil Sound deadening mat we used to soundproof a car door. Is this good for high heat applications such as the headliner? The answer to this question comes straight from the seller of this product. Note that you can use this to sound deadening under the hood of your car as well. Will putting a double layer of this help make your interior silent? I was wondering this while I was applying this to my car doors. I searched for a Reddit message board and indeed someone did use two layers and works wonderfully. It won’t cut the sound by half from having one layer; But the thicker you make it, the more noise it is able to absorb. here’s examples of how much you would have to buy if you want to do the inside of your doors. It will give you an idea of how much you will need for your own vehicle. How many square ft would be required for a Toyota Prius C? Here is a calculation for the doors only of a Chevrolet Tahoe. Please bear in mind that the below calculation might have a minor deviation in sqft. The two front door will require 26 sqft and the two rear doors will require 24 sqft total. For a full-size SUV, you would only need to purchase to packs of 36 seats. I hope that you found this article and tutorial helpful. Please leave a comment below if you’ve completed this process and let us know how it went.